Dr. Simone has dedicated his career to studying and perfecting advanced techniques that enable his clients to regain and maintain their quality of life and the dental health they desire. He is extremely passionate about dentistry. He feels privileged to have chosen a career that allows him to combine his technical knowledge with his artistic ability in caring for his patients. Dr. Simone completed his undergraduate degree at St. John Fisher College, earning a bachelor of science degree in biology. He is also an honors graduate from the State University of New York at Buffalo School of Dentistry, where he earned a doctor of dental surgery degree. Upon graduation from dental school, Dr. Simone completed a residency in general dentistry at Rochester General Hospital. This postgraduate work allowed for additional training in the dental specialties. 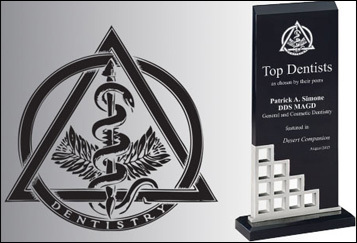 He is a member of the American Academy of Cosmetic Dentistry, American Academy of Dental Practice Administration, American Dental Association, Nevada Dental Association and the Clark County Dental Association. He is a fellow in the International Congress of Oral Implantologists. He is also a Master in the Academy of General Dentistry, an accomplishment achieved by only 1% of the dentists in the United States. To receive advanced training and experience in the field of cosmetic and reconstructive dentistry, he participated in the Pacific Aesthetic Continuum at the University of California San Francisco and the Seattle Institute for Advanced Dental Education. He has served on the Nevada State Dental Peer Review. Dr. Simone is also adamant about his commitment to continuing education and remains current with the latest dental research, technology and techniques. To share his knowledge and passion, Dr. Simone is also a faculty member at the UCLA School of Dentistry Center for Aesthetic Dentistry. He is licensed and trained in providing IV conscious sedation techniques for those patients who allow their fear to prevent them from seeking dental care. Born and raised in Rochester, New York, Dr. Simone has been a Las Vegas resident since 1986. He was the recipient of the 1997 Child Advocate of the Year award for providing volunteer dental care to foster children in Clark County. In his leisure time, he enjoys photography, flying sailplanes and spending time with his wife, Pam, and their Labrador Retriever, Enzo.